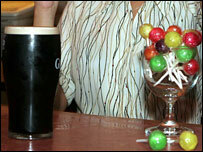 Revellers will be given lollipops as they leave clubs and pubs in Oxfordshire in a bid to reduce alcohol-related crime. Research claims to show the sweets have reduced anti-social behaviour after drinking. West Oxfordshire Community Safety Partnership has distributed 5,000 lollipops to premises in Witney. Police spokesman Dennis Evernden said: "The sugar rush has been shown to lower aggressive behaviour and reduce noise." The scheme has already been trialled in Scotland, Hampshire, Worcestershire and Gloucestershire. The lollipops, which come in four flavours, also feature the Nightsafe logo - a scheme which aims to reduce under-age drinking and alcohol-related crime.